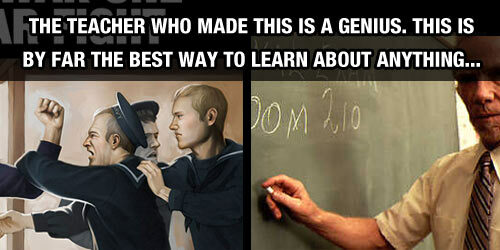 A great history lesson! 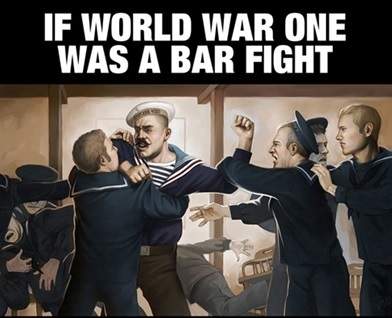 WWI as a bar fight: a strangely accurate analogy. Germany, Austria and Italy are standing together in the middle of a pub when Serbia bumps into Austria and spills Austria's pint. Austria demands Serbia buy it a whole new suit because of the new beer stains on its trouser leg. Germany expresses its support for Austria's point of view. Britain recommends that everyone calm down a bit. Serbia points out that it can't afford a whole suit, but offers to pay for the cleaning of Austria's trousers. Russia and Serbia look at Austria. Austria asks Serbia who it's looking at. Russia suggests that Austria should leave its little brother alone. Austria inquires as to whose army will assist Russia in doing so. Germany appeals to Britain that France has been looking at it, and that its sufficiently out of order that Britain not intervene. Britain replies that France can look at who it wants to, that Britain is looking at Germany too, and what is Germany going to do about it? Germany tells Russia to stop looking at Austria, or Germany will render Russia incapable of such action anymore. Britain and France ask Germany whether it's looking at Belgium. Turkey and Germany go off into a corner and whisper. When they come back, Turkey makes a show of not looking at anyone. Germany rolls up its sleeves, looks at France, and punches Belgium. France and Britain punch Germany. Austria punches Russia. Germany punches Britain and France with one hand and Russia with the other. Russia throws a punch at Germany, but misses and nearly falls over. Japan calls over from the other side of the room that it's on Britain's side, but stays there. Italy surprises everyone by punching Austria. Australia punches Turkey, and gets punched back. There are no hard feelings because Britain made Australia do it. France gets thrown through a plate glass window, but gets back up and carries on fighting. Russia gets thrown through another one, gets knocked out, suffers brain damage, and wakes up with a complete personality change. Italy throws a punch at Austria and misses, but Austria falls over anyway. Italy raises both fists in the air and runs round the room chanting. America waits till Germany is about to fall over from sustained punching from Britain and France, then walks over and smashes it with a barstool, then pretends it won the fight all by itself. By now all the chairs are broken and the big mirror over the bar is shattered. Britain, France and America agree that Germany threw the first punch, so the whole thing is Germany's fault. While Germany is still unconscious, they go through its pockets, steal its wallet, and buy drinks for all their friends.